This chart is incorrect in how it distinguishes 18.2-57 from 18.2-51. 18.2-57 can be violated by actions that are either malicious (motiviated by ill will or spite - a la 18.2-51 malicious wounding/bodily injury)or unlawful (motivated out of the heat of passion, a la 18.2-51 unlawful wounding/bodily injury). All that is required is that the touching be intentional, nonconsensual, and, minimally, be motivated by insolence. Thus, the words "malice, but" should be removed from the purple words above the arrow pointing to 18.2-57. There is also another error besides inten. The other distinction between 18.2-57 and 18.2-51 is injury. 18.2-57 requires no injury. However, 18.2-51, in both its malicious and unlawful forms, requires wounding or bodily injury. True, the wounding or bodily injury can be minimal - even slight tearings of the skin suffice. But the Commonwealth must prove that it exists. Thus, this needs to be added to the chart as a distinction between 18.2-57 and 18.2-51. Yes, I've read the case law and understand that a battery is the least unwanted touching in rudeness or anger. The words "malice, but" come from the case law which establishes that malicious wounding/injury has two lesser included offenses which are not lesser includeds of each other, but depend on which of the two intents the jury finds missing. 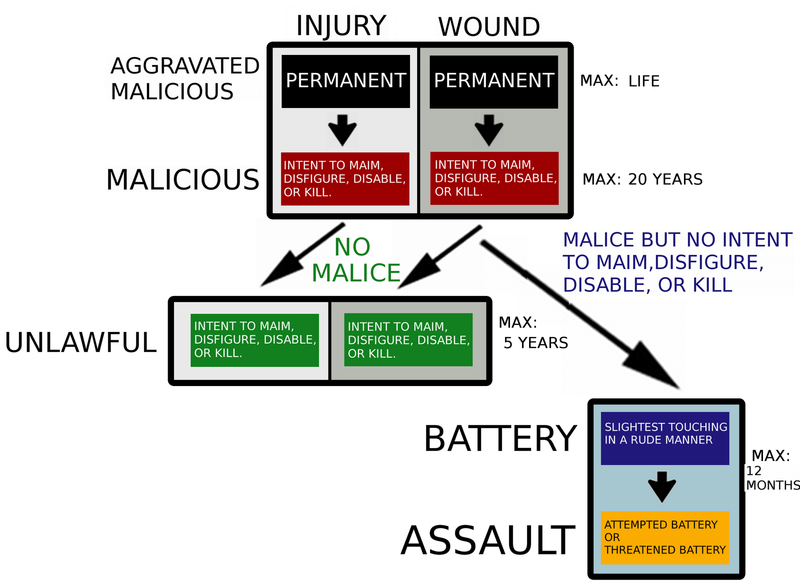 If no malice, unlawful wounding; if no intent to maim, disfigure, disable, or kill, then battery. The arrows are a reflection of where things stand as lesser included offenses. I agree that malicious injury/wounding requires an injury or wound. That's why the labels above say "Injury" and "Wound"; they both name the crime and describe an element. It was meant for those labels to be applied down the chart to those boxes of the same color and why battery was set off to the side and put in a box with a different color. As far as it goes, I think that it represents the law generally, but it suffers from the problem any chart like this does. The simplicity sacrifices nuance.